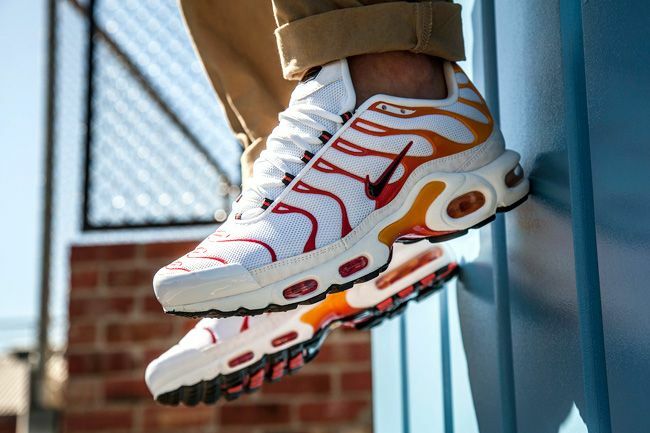 The classic Nike Air Max Plus Tuned 1 has finally made its long awaited return this year and some really nice colorways are starting to leak out including this well done "Sunburn" makeup thats perfect for summer. Chilling red, university gold, black and white are all utilized on the shoe making every inch of the silouette pop. You can look for these at some select Foot Locker locations worldwide as well as eBay if you cant find them retail.